This article is about a Buddhist monk who became a minor deity. For the Liu Song general, see Tan Daoji. For the 1985 television series, see Ji Gong (TV series). Ji Gong (Chinese: 济公, 2 February 1130 – 16 May 1207), born Li Xiuyuan and also known as "Chan Master Daoji" (Chinese: 道濟禪師) was a Chan Buddhist monk who lived in the Southern Song. He purportedly possessed supernatural powers, which he used to help the poor and stand up to injustice. However, he was also known for his wild and eccentric behaviour, and for violating Buddhist monastic rules by consuming alcohol and meat. By the time of his death, Ji Gong had become a folk hero in Chinese culture and minor deity in Chinese folk religion. He is mentioned by Buddhists in folktales and kōans, and sometimes invoked by oracles to assist in worldly affairs. Li Xiuyuan was born to a former military advisor, Li Maochun. After the death of his parents, at the age of 18, Li was sent to Hangzhou and was ordained as a monk in Lingyin Temple. He was mentored by the vinaya master Huiyuan and was given the monastic name Daoji. Unlike traditional Buddhist monks, Daoji did not like following traditional monastic codes. He had a penchant for openly eating meat and drinking wine; his robes were often tattered and dirty from travelling from place to place, and stumbling while intoxicated. However, Daoji was kind-hearted and was always ready to lend a helping hand to ordinary people. He would often treat the sick and fight against injustice. The monks, bewildered and fed up with his behaviour, expelled Daoji from the monastery. From then on, Daoji roamed the streets and helped people whenever he could. 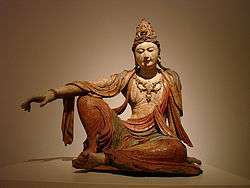 According to legend, while cultivating the Buddha's teaching, Daoji attained supernatural powers. Many who noticed his eccentric yet benevolent and compassionate nature began to think that he was an incarnate of a bodhisattva, or a reincarnate of an arhat. He was widely recognised by people as the incarnate of the Taming Dragon Arhat (simplified Chinese: 降龙罗汉; traditional Chinese: 降龍羅漢; pinyin: Xiánglóng Luóhàn), one of the Eighteen Arhats. When Daoji died at Jingci Monastery on the 14th day of the 5th Lunar month (17 June 1207), syncretic Taoism began to revere Daoji as a deity. Not long after that, Buddhism began to recognise Daoji's compassionate efforts and he is involved in many classic kōans. A new Buddhist movement, the Hong Kong-based Tung Cheng Yuen Buddhist Association (Chinese: 東井圓佛會; pinyin: Dōngjǐng Yuánfú Huì), worship him. Yiguandao has also adopted him into their pantheon of deities, citing Zhang Tianran, contemporary founder of the Yiguandao, as his reincarnation. Ji Gong can usually be seen smiling in tattered monastic robes, and usually carries a bottle of wine in his right hand, and a fan in his left hand. He wears a hat with the Chinese character Fo (佛), meaning "Buddha". He can also be seen holding his shoes in his right hand. Because of his carefree nature, he is rarely ever shown with a serious facial expression. Ji Gong has been portrayed by numerous actors in films and television series from as early as 1939. Chinese novel Ji Gong Quan Zhuang (濟公全傳) by Guo Xiaoting (郭小亭). Adventures of the Mad Monk Ji Gong: The Drunken Wisdom of China's Most Famous Chan Buddhist Monk, Guo Xiaoting; John Robert Shaw trs., Tuttle Publishing, 2014. The Living Buddha (濟公活佛), a 1939 Hong Kong film starring Yee Chau-sui. Ji Gong, Reincarnated Buddha (濟公活佛), 1949 Hong Kong film starring Yee Chau-sui. How the Monk Chai Kung Thrice Insulted Wah Wan-Lung (濟公三氣華雲龍), a 1950 Hong Kong film starring Yee Chau-sui. The Mischievous Magic Monk (濟公傳), a 1954 Hong Kong film starring Hung Boh. A New Tale of the Monk Jigong (A New Tale of the Monk Jigong), a 1954 Hong Kong film starring Leung Sing-bo. Ji Gong Sets the Fire on the Impenetrable Pi-pa Spirit (濟公火燒琵琶精), a 1958 Hong Kong film starring Leung Sing-bo. Ji Gong, the Living Buddha (濟公活佛), a 1964 Hong Kong film starring Sun Ma Sze Tsang. A Modern Ji Gong (摩登濟公), a 1965 Hong Kong film starring Sun Ma Sze Tsang. Ji Gong Raids the Courtoom (濟公大鬧公堂), a 1965 Hong Kong film starring Sun Ma Sze Tsang. Ji Gong Is After the Demon (濟公捉妖), a 1965 Hong Kong film starring Sun Ma Sze Tsang. Ji Gong and the 8 Immortals (濟公鬥八仙), a 1966 Hong Kong film starring Sun Ma Sze Tsang. The Magnificent Monk (濟公活佛), a 1969 Hong Kong film starring Cheung Kwong-chiu. The Living Buddha Chikung (濟公活佛), a 1975 Hong Kong film starring Yueh Yang. The Mad Monk (佛跳牆), a 1977 Hong Kong film produced by the Shaw Brothers Studio, starring Yeh Feng. The Mad Monk Strikes Again (烏龍濟公), a 1978 Hong Kong film produced by the Shaw Brothers Studio, starring Yeh Feng. Xin Ji Gong Huo Fo (新濟公活佛), a 1982 Taiwanese film starring Hsu Pu-liao. The Mad Monk (濟公), a 1993 Hong Kong film starring Stephen Chow. Ji Gong: Gu Cha Fengyun (濟公·古剎風雲), a 2010 Chinese film starring You Benchang. Ji Gong: Cha Yi You Dao (濟公·茶亦有道), a 2010 Chinese film starring You Benchang. Xianglong Luohan (降龍羅漢), a 1984 Taiwanese television series produced by CTV, starring Hsu Pu-liao. Ji Gong (濟公), a 1985 Chinese television series produced by Shanghai TV and Hangzhou TV, starring You Benchang. Hutu Shenxian (糊塗神仙), a 1986 Taiwanese television series produced by TTV, starring Lung Kuan-wu. Ji Gong (濟公), a 1986 Hong Kong television series produced by ATV, starring Lam Kwok-hung. Daxiao Ji Gong (大小濟公), a 1987 Taiwanese television series produced by CTS, starring Shih Ying. Kuaile Shenxian (快樂神仙), a 1987 Taiwanese television series produced by TTV, starring Cheng Ping-chun. Ji Gong (濟公), a 1988 Chinese television series produced by Shanghai TV and Hangzhou TV, starring You Benchang and Lü Liang. Ji Gong Huo Fo (濟公活佛), a 1989 Chinese television series produced by CTPC and Ningbo Film Company, starring You Benchang. Ji Gong Xin Zhuan (濟公新傳), a 1991 Taiwanese television series produced by CTV, starring Ku Pao-ming. Ji Gong (濟公), a 1995 Taiwanese television series produced by TTV, starring Chou Ming-tseng. Ji Gong Huo Fo (濟公活佛), a 1997 Taiwanese television series produced by CTV, starring Chou Ming-tseng and Lin You-hsing. The Legends of Jigong (活佛济公), a 1997 Singaporean television series produced by TCS, starring Xie Shaoguang. The Legend of Master Chai (濟公), a 1997 Hong Kong television series produced by TVB, starring Joey Leung. Ji Gong You Ji (济公游记), a 1998 Chinese television series produced by Zhejiang TV, starring You Benchang. Zen Master (濟公傳奇), a 2001 Hong Kong television series produced by ATV, starring Karl Maka. Ji Gong (濟公), a 2007 Taiwanese television series produced by Formosa Television, starring Lung Shao-hua. The Legend of Crazy Monk (活佛济公), a three-season Chinese television series produced by Shanghai Chongyuan Cultural Company and Hangzhou Baicheng Media Company, starring Benny Chan. The three seasons were released between 2009 and 2011. New Mad Monk (济公活佛), a 2013 Chinese television series produced by Lafeng Entertainment, starring Benny Chan. Wikimedia Commons has media related to Ji Gong. Shahar, Meir (Nov 1, 1998). Crazy Ji: Chinese Religion and Popular Literature. Harvard-Yenching Institute Monograph Series, Cambridge (MA). 48. London: Harvard University Asia Center. p. 330. ISBN 0674175638. Katz, Paul (December 1989). "Book review (of Shahar's Crazy Ji)" (pdf). Chinese Studies. 18 (2): 441–447. BIBLID 0254-4466(2000)18:2. "Statue of monk Jigong with sunglasses". Nunn Temple. Chiayi City-Lake (orang-Pi). Sep 6, 1992. "The Legends of Ji Gong". Television series. Media Corp. 1997.